On October 6th, KMR Communications, Inc. held their second annual Girl's Night Out at Bruno Jamois Restaurant Club. I come across new and popular beauty, accessories and fashion companies all the time, so out of the dozen + companies that were present, I found a few that really caught my attention. The one company I really took an interest in is Votre Vu, a French luxury skin care brand. There are several Votre Vu products I can't wait to try out, including the Antioxidant Eye Gel ($49). The crystal blue moisturing gel seems very cool and refreshing to the touch, so I can't imagine how this would feel once I refrigerate it and then apply. I love the practical and convenient packaging of duette, combining two products in one - Luxe Lips moisturizing balm and Luxe Hand Creme. The balm is made from coconut oil, shea butter and beeswax with a hint of natural tropical flavor and the hand creme includes sunflower, grape seed and jojoba oils combined with aloe and wheat proteins with sweet aromas of almond and coconut. I love the built-in mirror that you see when you open up the lip balm. This is a great travel product, whether you want to carry it in your purse, gym bag or pack it for a weekend trip. 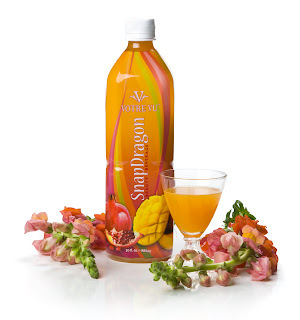 But the product I really fell in love with was the Snapdragon beauty beverage, blended with anti-aging super-fruits and botanicals. Mango, pomegranate and acai berry juices are mixed with green, white and red teas. The beverage includes seven daily vitamins plus collagen, aloe vera, foti, ginkgo biloba and baobab fiber. Hard to believe there are no preservatives or sugars because it is tasteful and refreshing - I find myself wanting more than one glass. There are only 70 calories per 8 fl. oz (240 ml) serving. You have the option of ordering a 2-pack for $23 or a 4-pack for $39. I've never associated a healthy drink with tasting well until I tried this one. I don't really like powdery drinks because I feel like the powder doesn't dissolve all the way and ends up at the bottom of the glass. Trust me when I say this tastes amazing. Votre Vu skincare is available at www.votrevu.com.